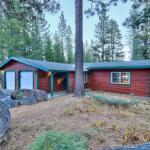 The Bears Den a property with a tennis court and a fitness centre is set in South Lake Tahoe 2.8 km from Washoe Meadows State Park 11 km from South Tahoe Ice Arena as well as 11 km from Heavenly Ski Resort. The holiday home is 12 km from Tahoe Queen. With direct access to a patio the holiday home consists of 3 bedrooms and a fully equipped kitchen. A TV is provided. The Bears Den South Lake Tahoe offers a barbecue. There is a a children's playground at this property and guests can go golfing nearby. Emerald Bay State Park is 12 km from the accommodation. The nearest airport is Reno-Tahoe International Airport 75 km from the property.